The Rocky Mountains can make one of the most memorable wedding backdrops in the world. Unfortunately very few of the preferred wedding venues offer onsite parking. With everything else the couple has to worry about on their special day transportation should not be one of them. That is where we come in. We can transport up to 200 guests from parking or lodging in town to the venue and back. We handle everything and can completely customize our service to fit your needs. Request a quote for your wedding transportation. Summit Express prides itself with having the newest and best maintained fleet in the mountains. Options include Ford Transit vans and finely appointed SUV’s. All vehicles are meticulously detailed and stocked with bottled water for your guests on your special day. 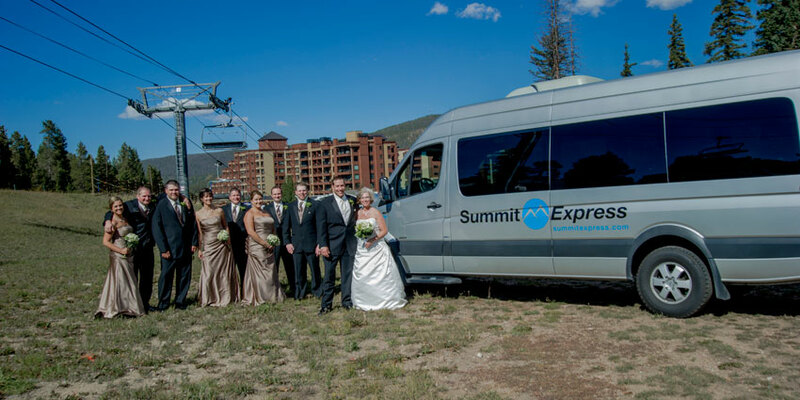 Summit Express can accommodate weddings anywhere in Summit and Eagle Counties. This includes Breckenridge, Vail, Keystone, Beaver Creek and Silverthorne. We also offer special discounted airport shuttle rates for your guests who are arriving from out of town.